Ahead of this Saturday’s Scottish Premiership trip to Ibrox, Motherwell manager Mark McGhee is taking heart from the fact that his side created numerous chances against Rangers in the recent Betfred Cup home game. Although ’Well succumbed 2-0 in that Group F match on July 16, they carved Rangers open several times in the first half and should have scored. McGhee said: “It is a tough game at Ibrox but we will get the players up for it. “We need to show that we’re a lot better than we were in losing to St Johnstone. I saw enough in the Betfred game to make me think we can cause Rangers problems this Saturday. “We were very unlucky in the Betfred game, although we’ll have to do a lot better again. Meanwhile, ’Well have sent English defender Louis Laing on loan to English League 2 side Notts County for five months. 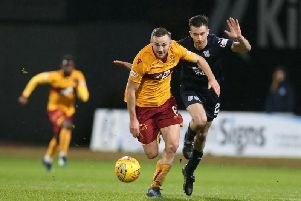 McGhee said: “Louis has lots of qualities but he needs to play games. McGhee said there had been no further offers for winger Marvin Johnson.